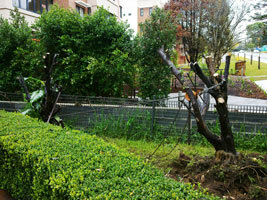 Sydney Tree Removals offers dead tree removal and emergency tree removal in the Stump Removal. Since dead trees and emergency situations often do not require local council permits to remove we can remove the dangerous tree without having to wait for a council tree removal permit. We also offer a wide range of other tree removal services in the Stump Removal such as tree stump grinding, powerline clearance pine & palm tree removal and tree maintenance. Our Stump Removal tree removal costs are competitive. Originally tree lopping in the Stump Removal meant cutting down the tree to ground level. Now days we refer to it as tree removal. If you want half a tree cut you can ask for tree topping, but the best course of action is usually to meet up for a free quote and discuss your tree removal options in plain English. We can remove any tree in Roseville South using rigging methods, cherry pickers, boom lifts, and other arborist trade secrets. We know what to cut, where to cut, and how to cut it, so your tree can be remove efficiently, or pruned without leaving unsightly damage. Sydney Tree Removals provide the best tree services for affordable prices to our clients in the Stump Removal. Our favourite suburb to work is in Roseville South because clients in that area generally recognise and believe in quality work. We pride ourselves of being able to safely perform stump removal for a reasonable stump removal price. There are many tree removal companies in Stump Removal that say they offer similar tree services, but they often lack experience, qualifications, insurance and expertise, and become a huge liability and risk. Don't risk it with any stump removal company in your Stump Removal area, call Sydney Tree Removals instead. Sydney Tree Removals are qualified stump removal professionals who dedicate themselves to stump removal in the Roseville South area. We are serious about our work, striving to deliver a friendly, reliable, and trustworthy tree service. Our goal is to remain as one of the best tree removal company in the whole of Sydney.